Grab your chainsaw and safety gear; it's time to get some much needed habitat work completed! 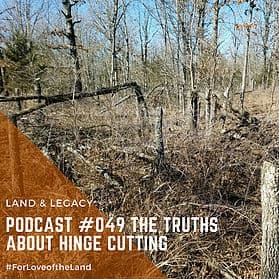 In this podcast we debunk myths on hinge cutting and discuss the best approach to creating bedding areas in the timber. Over the years a lot of misinformation has been shared about the technique of hinge cutting and the right and wrong way to do it. Today, we discuss what deer need and prefer when it comes to bedding as well as the best ways to use a chainsaw to produce the desired results. Deer need side cover, we can think beyond hinge cutting and use additional cutting techniques to give them exactly what they need.